October 1, 2014 0 comments on "Spider Deviled Eggs"
These spider deviled eggs are really easy and fun to make for Halloween. I saw the idea for them on Pinterest and had to try them, they looked so easy to make. They don’t take much longer to make than just making the deviled eggs themselves…just add olives! These were a big hit with my family, I will definitely be making them again before Halloween. 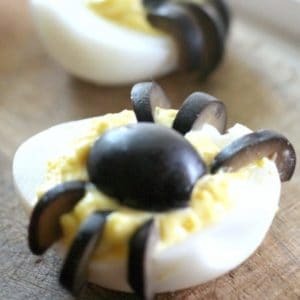 All you need to make these spider deviled eggs are eggs and black olives. Boil the eggs like you normally would for deviled eggs. Just add eggs to a sauce pan, cover with water, and boil for 12 minutes. Remove from heat and run under cold water while you peel off the shells. Cut the eggs in half lengthwise and remove the yolks. Place the yolks in a bowl and mash them with a fork. Add mayonnaise and mustard to taste. I don’t ever measure the mayonnaise and mustard, I just go by the creaminess of the mixture to see if it is done. Mix it with the fork until you get all the lumps out. You will need two medium sized black olives for each deviled egg half. Leave one whole and cut the other one in thin slices, and then cut the slices in half for the spider’s legs. It doesn’t get much easier than that! Place a spoonful of yolk mixture back into each egg half. Create a spider on top by placing a whole olive in the center of the yolk mixture and use the olive slices to make the legs. 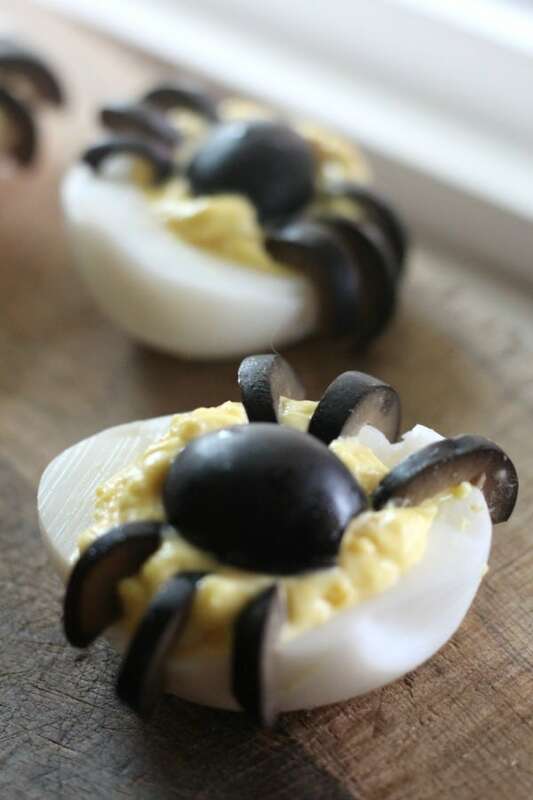 Like this recipe for spider deviled eggs? You might also like my spider cookies and my pumpkin patch dirt cups.